The headlock nut is made of machined aluminum, there is evidence of the cutting and lathe work giving it's round shape with the eight square sides. The bottom has part numbers and thread information stamped into it. The threads for the steerer tube are cleanly cut with a recession at the top for a spring washer which holds a rubber stem seal in place. The head key washer is made of stamped plate steel. The upper cup appears to begin as a round cast aluminum piece. The eight square sides are very cleanly cut away, again with very clean steerer threads. 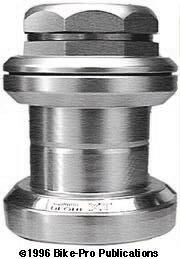 Inserted into the aluminum cup is a very highly polished bearing race. The cup is fashioned to permit the placement of a rubber O- ring at the lower circumference, and a plastic seal that both aid in keeping contaminants out. It's not clear if the upper race is machined from aluminum tubing or cast, but there seems to be some very smooth lathe work that on every surface that shows great exactness and precision. Pressed into the upper race is a highly polished steel bearing race. The lower cup is made just like the upper one, with the same O-ring and plastic seal arrangement. The lower race seems to be cast steel that is very precisely machined with perfect surfaces and a highly polished bearing surface. The lower race has a snap-in steel ring that surrounds the steerer tube at the base in a further effort to shield the headset. The steel ball bearings are held in a steel retainer, twenty 4.5mm diameter in the 1", twenty-two 4.5mm diameter in the 1 1/8", and twenty-four 4.5mm diameter in the 1 1/4". 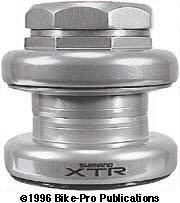 The XTR headset is Silver in color and comes in 1" (using a 32mm headset wrench for the upper cup and headlock nut), 1 1/8" (using a 36mm headset wrench) or 1 1/4" (using a 40mm headset wrench) sizes. The 1" size weighs 116.5 grams and has a stack height of 34.3 millimeters. What you pay for in this headset is the highest reasonable degree of production hand finished quality and machine work. The new XT (740, 741, 742) headset uses Shimano's new for 94 "cartridge" bearings. Let's say again from the outset these "cartridge" bearings are not of the type we describe in more expensive headsets, those we refer to as sealed cartridge bearings, and they are mechanical little marvels which these attempt to impersonate at a price. The XT cartridge bearings have ball bearings placed between interlocking steel races. The joined steel pieces enclosing the ball bearings give the "cartridge" the appearance of an oversized, common, steel cage, bearing retainer, with a concave (cupped) interior and a convex (rounded/arched) exterior. The "cartridge" has a squat, conical appearance. It should be said that the XT headset cartridge bearings are better sealed than the LX version by having a thin rubber seal on the concave side while the convex is fairly well shielded via the interlocking steel race pieces. The headlock nut is forged of aluminum alloy, post forge machining includes milling the top and threading the interior for the fork steerer. It has a hard Black plastic stem seal. The head key washer is stamped from 2mm thick plate steel, and somehow, is not recessed into either the locknut or the upper cone race. The upper cone race is forged of aluminum, with a eight sides for the wrench to grip. The threads are well cut. The upper cup is forged of aluminum and makes the seat for the cartridge bearing which faces convex side down in the cup. The cup has light post forge machining to make outer diameter of the inserted portion correct, de-burred and give a uniform appearance to the rest of the cup. The lower cup is made using the same techniques, with a chrome colored Silver decal to the upper facing of the cup. The fork cone race is Black steel. With the bearing properly seated and tightened in the upper assembly there is a deliberate 15/100ths of a millimeter gap or opening between the aluminum enclosure pieces. This gap occurs in an area of bearing that is enclosed with a rubber seal. The 740 series comes in 1" (115 grams), 1 1/8" (124.5 grams) or 1 1/4" (139 grams) sizes in a Silver color only. More specifics are in the headset table. If the 740 XT headset ever needs replacement bearing cartridges, they are available. These come sold as a pair. These are reasonably priced, relative to our cost. These two headsets are the least expensive of Shimano's new for 1994 "cartridge" type. The LX headsets use largely steel construction. The "cartridge" bearing for the LX again tries by inference to be recognized as the sealed cartridge thrust bearings but in doesn't really approximate it. Interlocking race pieces create a single piece styled in shape like a bearing retainer, having a concave (cupped) side and a convex (rounded/arched) side. Unlike the cartridges used in its brother XT headset, the LX lacks any rubber seals, and has fairly clear access to the 18 ball bearings within. The headlock nut is made of aluminum alloy, with post forging machining to tapp the threads, smooth the outer surface, and wrench gripping surfaces. Like the XT it has a hard Black plastic stem seal mounted at the top of the nut. Also like the XT its head key washer is stamped from 2mm steel plate. And like the XT, recessing the head key washer into either the headlock nut or the upper cone race has been overlooked. The upper cone race though all Black in color is actually two parts. The piece gripped by the headset wrench is made of aluminum alloy, this way the piece touching the steel steerer of the fork is metal, however the "umbrella" or skirt which actually covers and shrouds the bearing cartridge is made of Black plastic. 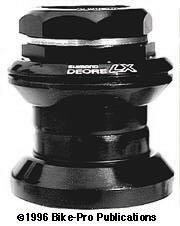 The upper bearing cup is made of Black colored steel. The upper bearing rests concave side up in the cup. As with the XT, when the bearing is properly installed, there is a deliberate gap of approximately 1/2mm between the cone and cup pieces around the perimeter. Both the lower cup and the fork crown race are made of Black colored steel. The lower bearing sits concave side down on the fork crown race. The model 563 comes in 1" (143 grams), and the 564 is 1 1/8" (158 grams). They are both made in a Black color only. More specifics are in the headset table.